Amazon may be getting ever deeper into a range of virtual products like media content and cloud services, but it is also continuing to add more features to lock down the bread and butter of its business: its e-commerce marketplace and the vast logistics operation that underpins it. 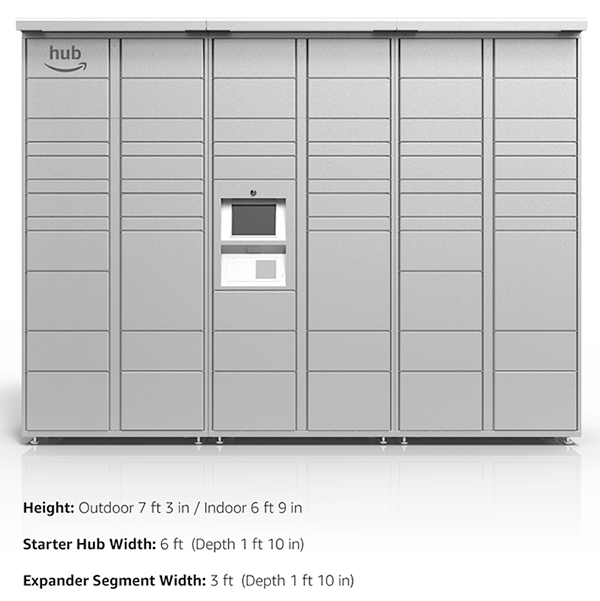 Today, Amazon quietly unveiled a new service called The Hub, lockers designed to be installed in multi-tenant dwellings so that residents can receive bulky packages and pick them up at flexible times. Key to the service is that Amazon is offering it as a delivery option for packages from anyone, not just Amazon and its affiliates. “You can pick up any package, from any sender, any retailer, at any time,” a promotional video on the site notes as the video scrolls through packages not just from Amazon and Zappos (owned by Amazon), but also unnamed retailers, and maybe your granny. The Hub appears to be a development on a service that Amazon has been running for several years now called Amazon Lockers, parcel delivery lockers that are located in public places and retailers to make delivering and picking up Amazon parcels more efficient. Significantly, both the Lockers and now these Hubs underscore a bigger ambition that Amazon has to lock in a segment of the logistics and delivery chain that has largely been out of its hands: last-mile (and even more specifically last-feet) delivery. This is also partly what has motivated some of the early work that Amazon has been carrying out with newer services like PrimeAir, its drone project to deliver parcels; and its acquisition of delivery services in specific markets, such as Colis Prive in France. All these efforts give Amazon more control over how packages arrive with customers and potentially cut down more of the costs of getting them there. That’s especially important to give better margins for services like Prime — Amazon’s membership scheme that gives subscribers free shipping on thousands of items (along with a bunch of other perks). Earlier today, when Amazon reported its quarterly earnings, its net income dropped by some $650 million and it fell more than a dollar short on earnings per share expectations, in part because of the investments it is making to grow. Improving margins is something that it will have to do eventually, and launching this today could well be a subtle sign from Amazon of one way that it might do that. Also not to be underestimated is the bigger impact of efforts like the Hub, beyond Amazon itself. The fact that Amazon is looking to provide the Hub not just for its own parcels but those of anyone also puts Amazon squarely into closer competition with erstwhile partners like FedEx, UPS and DHL. DHL happens to have its own residence-based locker system, the Packstation. And it is not the only one that’s made moves in this space. As with so many of the areas where Amazon muscles in, there are also a few startups that have also been trying to build businesses to tackle the same problem: They include Package Concierge and Luxer One. Google owns the assets of another would-be competitor, BufferBox, which it acquired in 2012 but then shut down. As with Amazon Lockers, The Hub is also solving a significant pain point for consumers, delivery companies and Amazon itself: if you buy something bulky that cannot be delivered to your regular mailbox, there are too many variables involved in making sure that you receive it. Unless you have a concierge in your apartment building, the packages either get redirected to parcel depots, or you have to rely on the goodwill of neighbors to take them for you, or they get delivered to your building’s management office, which may not be open all the time. “Hub by Amazon brings self-service delivery and trusted customer support together to create a package management solution you can count on,” Amazon notes in its promotional material. Amazon has not responded to our requests for more information, but as a point of comparison, in a competitive service from Luxer One, parcel locker installations appear to cost between $6,000 and $20,000, plus service fees, which presumably are costed out by landlords and property owners in the form of higher rents or other monthly service charges. That gives Amazon a big opportunity to undercut competition by cutting into that margin (as Amazon has done in so many other areas of its business). But cost is not the only potential downside, competitors claim. Luxer One believes offering an “agnostic” service is more private. For now, it looks like Amazon’s Hubs — which come in indoor and outdoor versions, and open by way of a digital keypad — are designed for private residences: when you click through to the section to apply to get a Hub on your own property, you are taken to a questionnaire that asks if you are the property owner, and if you are the owner of an apartment/condo, an office, or a house. It seems that you can’t progress to subsequent pages in the questions unless you indicate that you are the owner of an apartment building, but given the other options in the list, there may be some plans down the line to expand to other kinds of locations. We are asking Amazon for more details, such as pricing. Updated with comment from Luxer One.